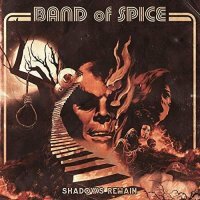 'Shadows Remain' is the third album under the Band Of Spice name. This group is effectively the solo vehicle for Christian "Spice" Sjöstrand (vocals/guitar) who is supported by Alexander Sekulovski (bass) and Bob Ruben (drums). The album is effectively a concept theme release with dark imagery that's based on an earlier period of Sjöstrand's life where he was affected by mental health issues, alcoholism and suicidal thoughts. The artwork is quite startling with its image carrying a hangman's noose and what looks like a stairway to hell with Dante's Inferno overtones. This release contains thirteen tracks that vary from Metallica Thrash-type Metal to Blues and even Jazz – it's a peculiar, eclectic mix. Opener 'Only One Drink' is a short vocal lament without backing that's quite pertinent given the vocalist's history. This is followed by the Metallica sounding 'The Pet' with its heavy riff, screaming guitar and harsh vocals. 'Coherent Train Of Thoughts' and 'Don't Bring Me Flowers' continue the heavy riff onslaught reminding me (at times) of early Megadeth. 'Caught In A War' borrows a riff/hook from a well-known Jazz number and is basically addressing the different phases of depression where the song switches from loud to soft sections that reflect the many changes of mood – it's clever stuff. This album is a remarkable piece of work, but the difficulty it faces will be its ability to appeal to those who have a sufficient range of musical taste to be able to fully appreciate the entire release and indeed live with the dark nature of the lyrical content. My personal highlights would be '...War' and '...Flowers'.